AdipoLife™ DfKt™-2 Adipogenesis Medium differentiates Human Mesenchymal Stem Cells (HMSC) derived from bone marrow (BM) and Wharton’s Jelly (WJ) into adipocytes. 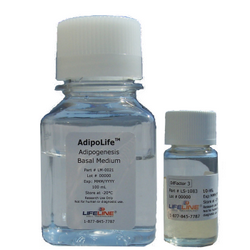 AdipoLife™ DfKt-2™ is offered in a kit format composed of basal medium (100mL) and a combined solution of differentiation factors called DifFactor™ 3. This kit allows you to prepare fresh medium in your laboratory, extending shelf life and enhancing performance. AdipoLife™ Basal Medium comes in a 100 mL bottle. AdipoLife™ Basal Medium contains no antimicrobials and no phenol red. Antimicrobials are not required, but are recommended during differentiation due to the duration of culture and the frequency of handling of the cultures. Lifeline®offers antimicrobials and phenol red separately. AdipoLife™ DfKt-2™ shows efficient differentiation as demonstrated by the accumulation of lipid vesicles. Shown above, left: Wharton’s Jelly Mesenchymal Stem Cells, passage 3, 5 days after inoculation with 5,000 cells/cm2(100X). Shown above, right: Wharton’s Jelly Mesenchymal Stem Cells differentiated into Adipocytes using AdipoLife™ DfKt™-2 and stained with Lifeline® Oil Red O Lipid Staining Kit, post 4 weeks differentiation (100X).